‘Anyhow, there’ll be plenty of jam in heaven, that’s one comfort,’ he said complacently. Anne nipped a smile in the bud. ‘Why, it’s in the catechism,’ said Davy. My mother has quoted at me “God makes preserves” more times than I can count (though I should point out for the sake of her reputation as a mother that she never let me believe it). And if God enjoys making preserves, why shouldn’t we? The clearest bit of the jam-making process that I remember from being little was collecting the fruit. Admittedly, my brother and I were weirdly enthusiastic about many collecting things, particularly conkers. One year we collected enough conkers from Twickenham Green to fill what I remember as ten or twenty huge plastic boxes, though this memory could be a victim of the innate hyperbole of a child’s mind. We’d rummage through the leaves, looking for the really shiny conkers or better yet, the spikey green balls that, if you were lucky enough, you could crack open carefully to reveal a completely perfect conker, untouched by other people’s fingers or even by sunlight. Mum used to help my brother peel the conkers. Then they’d soak one in green dye, and trace over the lines with a red biro to make a ‘rat’s brain’. Easily pleased, I preferred to try and find the best, roundest and shiniest conker of the year. Sadly though, however successful I was, the glossy sheen never lasted and before long my poor father had to come up with a means to dispose of what was undoubtedly many many kilograms of mouldy, unwanted, and by now unloved conkers. Near the house we lived in then was a park and near that an area of land left wild to help encourage local wildlife, especially birds. Both of these, and the playing fields near by were and still are full not only of the aforementioned elderflowers, but also brambles. We used to march down the road to these brambles, plastic tubs in hand, and set about collecting the blackberries. Now, the good thing about collecting blackberries rather than conkers was that they were tasty, and what’s more, Mum would help us make the ones we hadn’t eaten into jam before they succumbed to the mould that ruined the fun of the conkers. They had to come off the bush easily and in theory, for every one we ate straight off the bush, we had to make sure at least a few went into the tub. Sticky little fingers stained purple, we’d return home with blackberries in hand, terribly proud of ourselves and for some unfathomable reason, not quite hungry enough to finish dinner. The berries would be rinsed, plopped into the big Jam Pan and boiled up with plenty of sugar before being decanted into jars and eventually, far more importantly, spread on toast with peanut butter. Yum. When I was 10, we moved house, and discovered that the new house had two apple trees and a quince bush in the garden. The apple trees proved to have a bit of history to them: apparently the whole area used to be one big orchard. When they built the houses, the clever designer elected not to destroy all the trees (kind soul) but rather to leave every third or fourth three in every fourth or fifth row, and to build the back gardens and houses around them. This means, allegedly, that if you were to fly over our area in a helicopter, and look at the houses from above, you should be able to see all our little suburban apple trees line up rather marvellously, giving a vague indication of the orchard of times gone by. While I can’t vouch for the truth of this, I am the proud owner of (a copy of) a map of our area from the seventeen or eighteen hundreds, which indicates that there was indeed an orchard of some description in the area in which I believe our house is now. [i] And definitely it’s true that our next-door neighbour’s apple tree is exactly in line with ours, and more or less in the middle of the end of her garden. Apple trees and the resulting crumbles, cakes, juices and failed attempts at cider aside, the quince bush proved rather more exciting, in that it enticed my mother into experimenting with quince marmalades and jellies, and I have to say she got quite good at it. Later experiments with different sugars produced rather a delicious dark quince jelly (which, added to an onion gravy with a generous splash of port, make a delicious sauce for game). 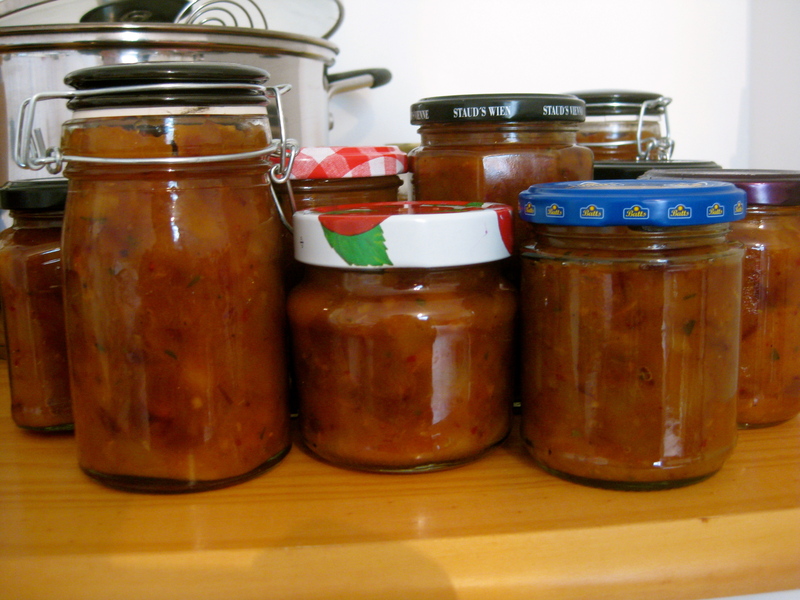 The successful outpourings of her quince laboratory spurred her on into playing with rhubarb, some of which we also have growing by the garden path, and the recipe she settled on for her rhubarb chutney is absolutely scrumptious (and especially good with sausages). Within a few years she had exhausted the supply of fruit in our garden, and so a couple of Christmases ago, my father bought her two crab apple trees as a present. I must admit that he didn’t attempt to wrap them; as we sat around the fireplace exchanging gifts, she unwrapped a bright green pipe-cleaner tree with apple bonbons adorning its branches and a little plastic crab gripping the top of the ‘tree’ with one claw in a sadly unsuccessful impersonation of the silver star atop the Christmas tree. The two varieties of crab apple proved to be a source of one very fragrant crab apple jelly, pinkish red in hue, and a soft orange Butterball Jelly with a rather honey-like flavour. A year or two later, a microscopist my mother visited for work purposes (don’t ask) nearly cried when my mother agreed to take home a big basket full of Bramley apples from her overburdened tree. The two Bramley apple jellies that resulted proved to be just as nice as the crab apple ones, and so, by now armed with quite the arsenal of homemade jams, jellies, chutneys and marmalades, my mother started the little homespun company, Twickenham Preserves. The small jars are now sold at Sandy’s Fishmongers and Last Try Wines in Twickenham, and tomorrow (1st July 2012) will be for sale at the Tiffin Boys’ School car boot sale in Kingston (just in case you happen to be passing). With a rather more successful version of my spicy pear chutney (which is very definitely a chutney this time, not a pickle) added to the mix, we’re rather hoping the people of Kingston like our little jars of jelly – after all, if God appreciates preserves, then they should be good enough for the rest of us, shouldn’t they? [i] My skills in reading modern maps are at best passable. My skills in reading ye olde maps I would not in any way shape or form rely upon. Ever. I’ve been promising myself, and promising and promising and promising, that I will get around to writing about my recent experiments with elderflowers. And finally, I have got around to doing it, and I’ve left it too late for anyone else to use the recipes or even try other recipes using the flowers this year, as they’re now out of season. So my first request is: please forgive me, and my first lesson is: elderflowers are only in bloom for a few weeks a year – don’t miss it! Armed with a trug full of elderflowers, I searched online for recipes for Elderflower Cordial. It seemed simple enough, and the only ingredient I didn’t have was citric acid. I popped out to a local pharmacy and headed home from successful – though only after being quizzed on what I wanted it for; apparently citric acid is used in the production of heroin. I’m fairly sure that, were I an accomplished heroin-producer, I’d be savvy enough to lie and pretend I made vast quantities of fruit cordial, rather than announce my drug-baron career and shady intentions. Anyway, my declaration of honest intentions believed and citric acid in hand, I began making my cordial. One of the best things I found about making it was that for twenty-four hours – and my mother will vouch for this – our kitchen smelled delicious. Sliced lemon and orange, elderflowers, sugar and citric acid were steeped in good old tap water, in my beautiful Mason Cash mixing bowl (the one I admired on my window sill for three days after being given it as a birthday present). I covered them with a tea towel, and left overnight, stirring occasionally. This simple mixture gave off enough perfume that every time you opened the kitchen door, you were greeted with a gust of floral deliciousness that made your mouth water and almost tricked your subconscious into believing it was actually sunny outside. The next day, I strained the mixture through muslin, bottled it and voila! The cordial was done. I have to say if you’re thinking of making this yourself, I don’t know how long it keeps for – I confess mine didn’t last that long; my mother and I drank it before we could find out. The success of the Elderflower Cordial Venture provoked my mum into asking that I find something to do with her bush of Lemon Balm. I experimented with Lemon Balm Cordial (exactly the same as the Elderflower recipe, except I substituted a lime instead of the orange) which was nice, but not as nice as the elderflower. However, the Lemon Shrub proved much nicer, not to mention a little more potent. I got the recipe from a book called Hedgerow Harvest that my mum bought from William Powell when she came to visit me, and it’s pretty simple. You take quite a lot of lemon balm leaves and rinse them, before sticking them in a bottles-worth of brandy with some lemons and lemon rind for three days. I then added half a bottle of dry white wine and sugar, and left for another two days before straining and bottling. It’s very easy, and the result is a little like Pimms – you can drink it on its own (though better over ice in my opinion as it’s quite strong!) but it’s also quite nice topped up with lemonade, or even sparkling elderflower. You can really taste the lemon balm, and it’s not too sweet either. Very refreshing, and Mum especially seems to enjoy it. I also experimented with an elderflower champagne from the same book, but need to experiment next year with the quantities of sugar used, and possibly add some sort of preservative (possibly more citric acid) as my finished ‘champagne’ was far too sweet for most to drink neat, and one bottle has started going ever so mouldy on top (and I haven’t even opened it yet). That said, the unmouldy bottles made for delicious mixers, especially when added to a gin and tonic on a recent hen weekend – though I must point out that using an alcoholic mixer makes your trusty G&T a little stronger than you expect, and the mother of the bride should back me up on that! I was quite amazed – and delighted – that I discovered things to make from (more or less) wild plants while living on the outskirts of London. And I know from previous experience that the areas where I found the elder also provide a decent harvest of blackberries in the Autumn, and if you pick the right time of year, there are even some wild plum trees hidden by the railway line. I make sure I wash the fruit and flowers thoroughly; being on the outskirts of a city, not to mention by a railway line and series of factories, I imagine they’re more prone to pollution than the same picked out in the countryside. But it was still great fun, and I even managed to use the left over fruit from the various concoctions described above to make a sort of marmalade jam, by chopping the peel, flesh and pith of the citrus fruits very finely and boiling up in a little elderflower cordial. I then weighed this, added 75% of that weight in sugar and boiled to setting point[i] before filling sterilised jars and sealing. It might not be luxury marmalade, but it helps limit waste and it tastes lovely on toast. All of my creations/experiments are poured, spooned or decanted into nice jars and bottles, some of which I bought and some of which are reused. I label bottles with big brown labels that you can tie on – this saves you peeling stickers of at a later date when you want to reuse the bottle again, and doesn’t look too bad. From experience I’d recommend using a water-resistant pen to do the writing – a few of my labels have ended up illegible as a result of having elderflower champagne splashed onto them during pouring. All in all, I’ve ended up with quite a nice array of delicious jams, curds and drinks, and if it wasn’t already obvious from this and previous posts, I’m quite proud of myself. Hopefully wherever I move next will prove just as fruitful (and flowerful) for more homemade experiments. [i] Put a saucer in the freezer until it’s very cold. Test your jam/marmalade mixture by putting a drop of it on the icy saucer. Leave for a few seconds, and then nudge with your fingernail. If the surface wrinkles, your jam is at setting point and ready to be poured into pretty jars. At the back of the house I lived in in Banbury was a little square of lawn. Well-kept and maintained by the landlord, the flowerbeds surrounding the grass sported some fairly hardy plants that could cope with the physical and emotional neglect of the residents. At the back, stood a tiny little Conference pear tree that last Autumn, either due to a freakishly warm spell earlier in the year, or simply its own enthusiasm and determination to prove itself, produced a crop of fruit so substantial that the weight of the pears snapped the main trunk of the tree (still only about 2-3cm in diameter). I called my landlord to explain that I had picked all of the not-quite-ripe pears from the tree, and strapped it up as best I could in the hope that without its fruity burden it might recover. I asked if the landlord and his wife wanted the pears, and in answer he explained, in a bemused tone of voice, that he had only bought the tree for decoration because it looked pretty. When I moved to Banbury last year, and despite my naivety when it comes to all things country, the girls I moved in with demonstrated fairly clearly that there is a whole other category of people who are in no way country-kitchen inclined. I stuck out like a sore thumb amid the hair extensions, acrylic nails, intense gym regimes and sunbeds, with my tweed coat (and yet only Joules tweed, not ‘real’ tweed), a pair of non-fashion wellies (despite what some people I’ve met in the last year might say about Hunters, mine are green and normal, not crocodile print, patent, beribboned, high-heeled or fluorescent) and my culinary habits. Admittedly, the girl who lived there before me had enjoyed cooking also (she and I in fact became good friends, and I’ve been lucky enough to taste some of the products of her kitchen, including the best Shrove Tuesday feast in history!) so the kitchen wasn’t entirely unused, but one of the current residents described her style of cooking as “pop, pop, pop!” alluding to the noise of piercing the film on ready meals before popping them in the microwave. The attitude of the girls probably goes some way to explaining my landlord’s bewilderment when I called him up to ask about the pears. But due to his lack of interest in the products of the pretty tree and his generosity, I was left with 6kg of under-ripe pears to play with. Even after leaving them to ripen for a few days, they weren’t sweet enough to enjoy in a crumble or cake, and so I decided to try and make chutney – the first time of doing so without my Mum taking the reins. I picked and followed a recipe from the web, and added my cranberries, apricots, chilli flakes, spices and vinegar to make a Christmas chutney. By the time I reached the end of the recipe, I was left with what seemed to me to be a slightly vinegary fruit salad. It bore no resemblance to either the chutney my Mum makes, or the chutney served in restaurants with pate and Melba toast. The fruit pieces were all still very much identifiable but warm with a sweet, tangy coating. Frustrated and disappointed, with two saucepans of this fruit mixture in front of me, and a house smelling rather strongly of vinegar, I decided I had only four options. After neither my mother nor grandmother answered the phone, I had only two: give up, or Google. Trusty Google suggested that other, non-pear based chutney recipes had vastly more sugar and vinegar than the recipe I had followed, and so after a mercy dash to the supermarket for more vinegar and a jam pan (I was running out of room in the pans I had been using), I took a deep breathe, hoped for the best and emptied a bottle of cider vinegar into the mixture, and added more sugar. Sure enough, after more cooking time and some stirring, poking and prodding, I was left with a mixture that looked much more like chutney. The only problem was, it tasted very much more like a pickle. Never one to be defeated, I sterilised some jars, filled them with the mixture, wiped the edges and sealed them. Later on, I covered each lid in a square of tweed, tied them with rafia and labelled them all as ‘Spicy Christmas Pickle’. 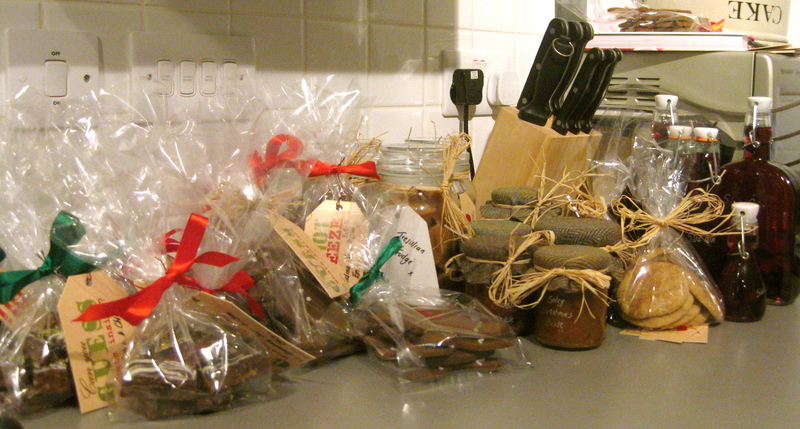 These jars of pickle – and I had quite a few of them – were the beginning of my Christmas hampers last year. It was only September, but still I started collecting bits and pieces as I went along. Empty Dowe Egberts coffee jars from the office were perfect for homemade fudge. I bought some cheap but nice jars and a basket from a warehouse sale, and knowing my mother’s taste for gardening, bought a rather lovely trug as the base for my parents’ hamper (she has sworn to actually use it to garden, and not keep it ‘for best’). Closer to Christmas, I set about making the other bits and pieces. I strained and bottled half of my sloe gin, and made up a batch of fudge from a recipe given to me by a colleague – a sort of cross between fudge and Scottish tablet, very yummy and very moreish. 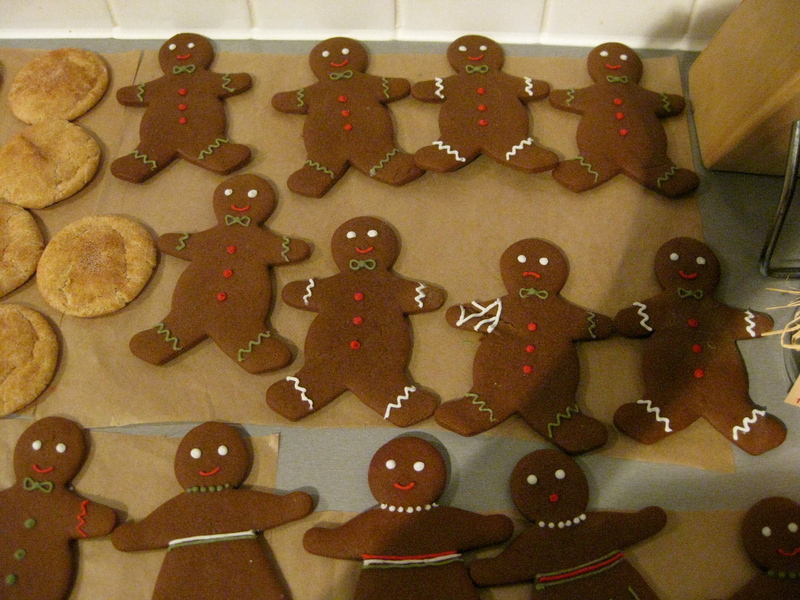 Then I began the epic battle with the gingerbread men. I mixed up a batch of gingerbread men, and having carefully cut them out and baked them to perfection, laid them carefully in my biscuit and cake tins until I was ready to ice them. Sadly, either a caring housemate or gravity caused the lid of the tin (balanced slightly on top, as my biscuit tin was too popular, and over filled with gingerbread guests) to close properly, and broke every single gingerbread person bar two. After a whiny phone call to complain to a friend, I took another deep breath and piled the broken pieces into a container to be taken to work (people there were always happy to help clear away the evidence of baking mishaps), then set about making another batch. I used the opportunity to use a different recipe, as the one I’d followed originally didn’t seem that gingery or spicy to me, and I wanted my gingerbread men to have a real spicy flavour. The new recipe had black treacle (molasses) and far more spices, and I used the syrup from a jar of stem ginger instead of golden syrup to add to the flavour. After baking, I spread them all out on the kitchen counter to cool before icing – and there were quite a lot of them. My housemates couldn’t believe it when they walked into the house one evening, slightly tipsy, to see their kitchen turned into a Gingerbread Man production factory. Once they’d got over the shock, they agreed to be my taste testers, and agreed that the newest batch of gingerbread men was much tastier than the old one. And after icing in red, white and green (it was Christmas after all!) they looked the part too. 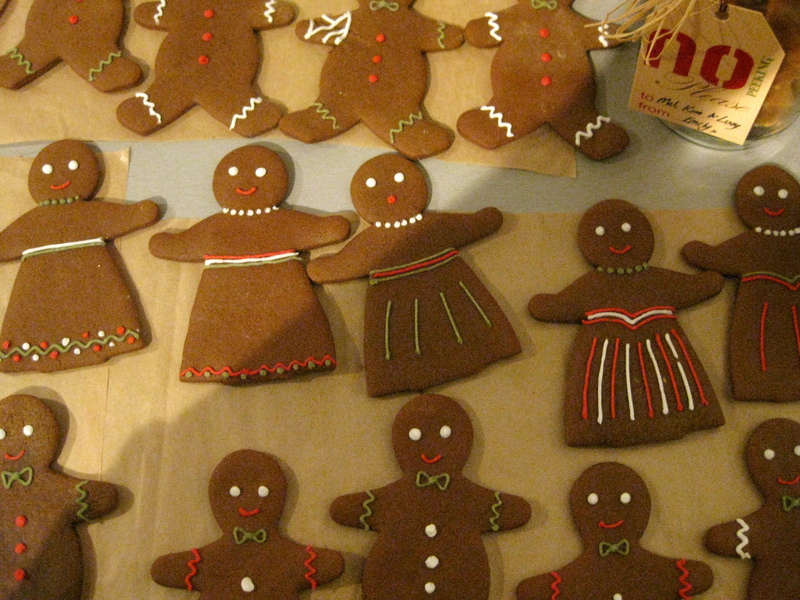 Once fully cooled and set, they were bagged up in groups of four (with at least one gingerbread lady per bag), tied with red or green ribbons, and labelled for the appropriate family members. Final additions were made: some chocolate fridge cake bars (with edible gold stars on for a bit of Christmas sparkle), soft cinnamony Snickerdoodle cookies for grandparents with false teeth, a few prettily wrapped bars of soap we’d had come in at work, novelty Geordie-themed items for my Northern grandmother, and a couple more gardening and home bits for Mum and Dad. For those recipients who I knew wouldn’t appreciate clutter, the bits and pieces were popped into recyclable cardboard boxes wrapped in wrapping paper instead of baskets, and were filled with raffia or tissue paper. The results looked pretty, were very well received and according to feedback were tasty too. The things to remember when making bits yourself are never to be deterred, and to use your imagination to personalise and also to cover up mistakes. One of my gingerbread men was blessed (cursed?) with ginger hair for one of my best friends – only because I knew how much it would irritate him. And when I dropped the edge of the baking tray onto one still-soft gingerbread man’s arm, he was graced with a white-iced bandage and sad face when it came to icing. You can add a sense of humour to your gifts, and while it sounds cliché, people really really do appreciate the effort you’ve put in. I’ll definitely be doing it again, though possibly not next year as I think it might be my turn to cook Christmas dinner again, and there’s only so much cooking one person wants to commit to at Christmas. I cannot for the life of me remember what inspired this, or even planted the seed in my head, but driving down the M40 one evening, I decided I wanted to make lemon curd. I quickly checked a recipe online (the combined joys of internet on a mobile, and Nigel Slater’s lovely recipes for The Guardian) and stopped off at Tesco Express to buy a bag of lemons. The next day I whisked up about two jars of lemon curd, and provided that you’re patient, and don’t take your eye off it – multi-tasking is not a talent to be boasted of when discussing the art of making lemon curd – it really truly is remarkably easy, and so so much tastier than shop-bought. The first thing I did was lick the spoon. The second thing was to eat a full spoonful. And only then did I make lemon cheesecake cupcakes. 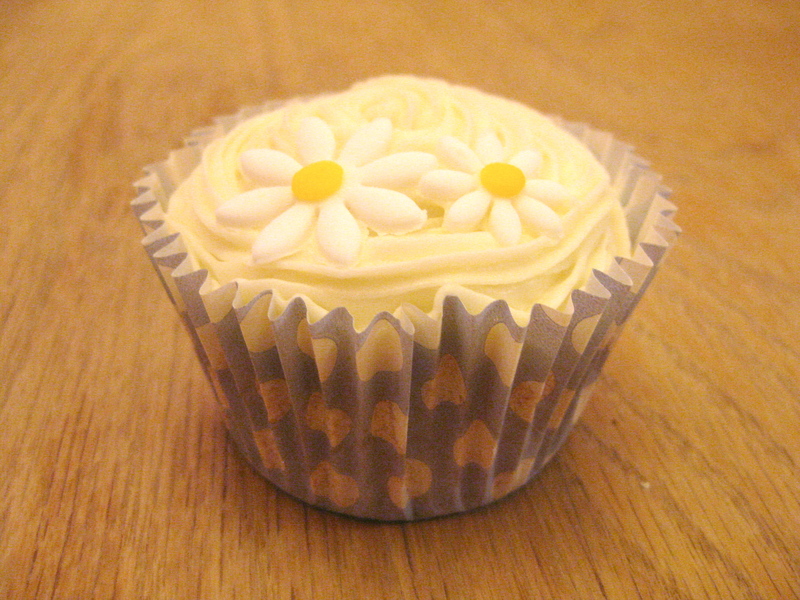 This was also my second venture into Proper Icing. In Summer 2010 I ended up making my first Proper Cake. I had started making a fruit cake for my friend and flatmate for her 21st birthday (fruit cake is a favourite of hers). The week before her tea-party-themed birthday celebrations, she called me and said that her grandmother (the designated cake-maker) was ill, and would it be possible to have the fruit cake as the cake for the Main Event. Worried it wouldn’t be large enough – and also, many people don’t enjoy fruit cake – I knocked up a quick, simple Victoria Sandwich, and then set to icing them. Trying to fit in with the elegant, Summertime theme of the party, I decided to ice them in lilac and white. It’s important to bear in mind at this point that I don’t like icing myself, and we haven’t had iced cakes in many, many years. Mum made us each a birthday cake every year, but long ago she started icing them in coloured white chocolate, as none of us ate the icing. So my experience of proper icing was precisely none, but not to be deterred, I rolled out my lilac icing and set to laying and smoothing it over the cakes. One cake iced in lilac, with a white fully edible icing bow, and the other in white with a lilac equally-as-edible bow, I have to confess they looked rather lovely. And aside from a brief panic when one of the bows shattered the night before the party (my boyfriend of the time, darling that he was, rushed over via the cookshop bringing the emergency lilac sugar paste, and calmed me down as I quickly rolled, modelled and assembled a replacement bow), and an incredibly tense drive from London to Northampton with the cakes on the back seat, it all went remarkably smoothly. Unknown to me, I was in fact paid for the cakes by my friend’s father, though this was arranged between him and my boyfriend behind my back and I was only told about it the next day. But this did officially make these two cakes my first ever commission. [i] Two colleagues at work have set me some cake-related challenges, so I suspect one of those will be the next Cake Adventure to be featured here. Stay posted. The same colleague who took me to the Horse Farm invited two of us to join her at the Bicester Hunt and Whaddon Chase (I think that’s right) Halloween Ball at Aynhoe Park, and I can honestly say I’ve never been to anything like it, ever. Dressed to the nines in a backless dress, and armed with cobwebs and a single white contact lens – it was Halloween after all – we drove into the courtyard to be greeted by two gargantuan hands clasped together and thrust up through the flowerbed. Walking in, penguin-dressed waiters welcomed us proffering green gin-based cocktails with dry-ice cubes in emitting a trickling stream of fog. Clutching our smoking, bubbling cocktails we entered a house surreal enough to rival Alice’s rabbit hole – and this was real. Bathed in eerie red and green light, with guests swanning around elegantly in full dresses, capes, top hats and one sexed-up Marie Antoinette outfit, the rooms were filled with a range of taxidermy the like of which I’ve never seen, and will probably never see again. A full-size giraffe on the dance floor (I seem to remember it wearing a top hat, though that may have been the cocktails taking their effect), a prowling lion by the bar, a polar bear, mounted zebra heads, more stags heads and antlers than I could count, and a penguin dancing in the elaborately turquoise ladies’ bathroom. White marble statues mingled in amongst with the animals, and with the lights and the smoke from everyone’s cocktails, a probably too-generous helping of gin and miniature food brought round on silver platters midway through the night, it was absolutely wonderful, truly a night to remember. The next day was the next step forward in my Country Education, and my first experience of the previously mentioned sloe gin making. London-born and university-educated, a night out is something I Can Do, eyes closed and hands tied behind my back (not yet literally – but who knows what the future holds?!) But spending the night at my friend’s cottage revealed a hangover cure as yet unknown to me. A traditional, greasy and delicious fry up from a roadside diner nearby was entertaining – many locals suffering a similar fate joined us for breakfast, dressed in an array of costumes in various states of bedraggleness. 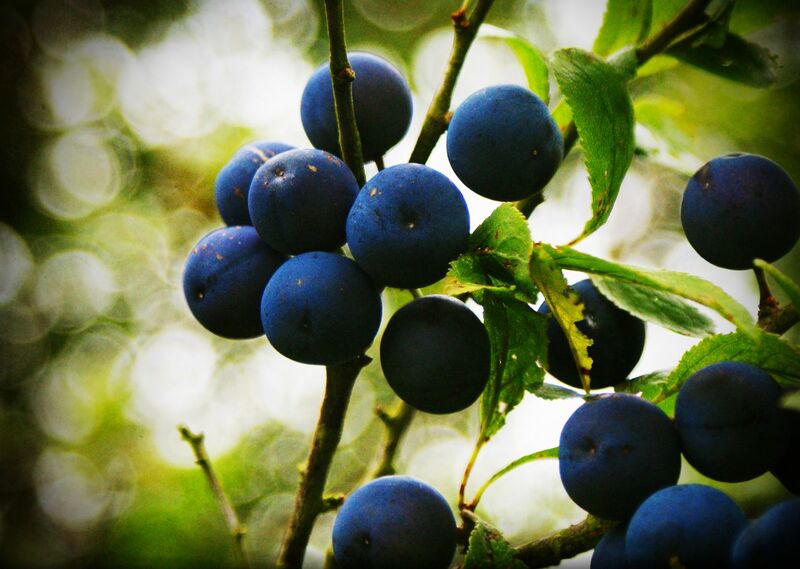 But later on my friend took me out to walk her dogs, and feet shoved into my far-too-shiny wellies[i] and armed with a big Tupperware box, we went sloe picking. It was like the blackberries I picked with my Mum on a much bigger scale, with more nettles and ditches to negotiate and bigger thorns, but no cars roaring in the background. Crisp fresh Autumn air proved a much nicer hangover cure than hiding under my duvet, and returning home with 2kg of sloes as well as my hangover felt much better and more productive than returning berryless would have. I was given instructions on turning my berries into sloe gin, and told you must be sure to only pick the berries after the first frost. Apparently if you’re impatient, you can also pick them and pop them in the freezer overnight (though ‘In the freezer overnight’ didn’t make quite as nice a title for this blog). You then prick each berry with a pin, which is best done in front of an entertaining television programme with one bowl on either side and a tea towel or apron on your lap. It’s not fast, but it’s not hard either. You pop each pierced berry into the gin with some sugar and leave it be. Some say around two months will do (and I decanted some after this time to be given to family as Christmas presents) but someone else said that a minimum of six months is needed, so I’ve left one bottle to mature for a few more months, and if I can resist temptation might even leave it ‘til next year to open. Part of me is also considering sealing up a small bottle and hiding it somewhere to be discovered in years to come, and see what difference that makes. The freezing aspect of the ‘recipe’ makes complete sense when you think about it – and anyone who’s ever forgotten about a can of coke/beer/bottle of wine popped in the freezer to chill will know why. A berry is full of juice and when frozen that will expand, breaking the cell walls inside. So release the juice inside the berry, and it will seep out of the pinhole far more readily than out of an unfrozen berry. A new friend’s boyfriend told me that you can also lay your berries out and crush them with a rolling pin, but apparently this will lead to cloudy gin. The pinprick keeps the bits of berry inside the skin and lets the juice out, resulting in lovely deep pink clear sparkly sloe gin (or so I hope). Spending the night at my friend’s cottage with a front door key bigger than her hand; meeting her pretty little chickens (and being sent home with some fresh eggs, smaller than a normal egg but much, much tastier); sloe picking with the dogs on a frosty morning; all of this made me want more than ever to keep discovering more about this world, even if I continue to be laughed at along the way. Before Christmas I made sloe gin for the first time, which I’ll be writing about at some point. It inspired me – I took the cheapest of the cheap gin I could find, and by adding bits and pieces have turned it into something deliciously yummy and homemade. I don’t know why students haven’t turned to this before to make cheap alcohol taste good. Though a) thinking back the patience involved probably wouldn’t have gone down too well at university… I daresay a bottle of gin topped up with sloes and sugar would have been drunk hours after preparation as part of a dare or game of Ring of Fire, if not before the sloes and sugar were even added. And b) in their own fashion, they do… and skittle vodka certainly requires less effort than popping hand-picked pin-pricked sloes into a bottle one by one. I’ve always been a fan of anything mulled and spicy (wine, cider, apple juice, chai latte, ginger cake; if it’s sweet and spicy then I’ll like it) so last week I decided to try making a mulled, apple-y spirit in a similar fashion to the sloe gin. After my adventures into making homemade bits and bobs in the Autumn term of first year post-uni (recipes to follow) I mentioned to Mum and Dad over Christmas that if they had any nice bottles or jars, they should pass them my way. Days later when Mum came to visit, she dutifully turned up with a huge box of jars and bottles, hoping to be filled with deliciousness (and possibly then returned to my parents as gifts no doubt). Amongst these treasures now occupying the dusty space on top of my wardrobe, were two lovely big square Kilner jars (my love affair with jars is possibly a bit peculiar, but I do derive enormous comfort and pleasure from a nice heavy jar). 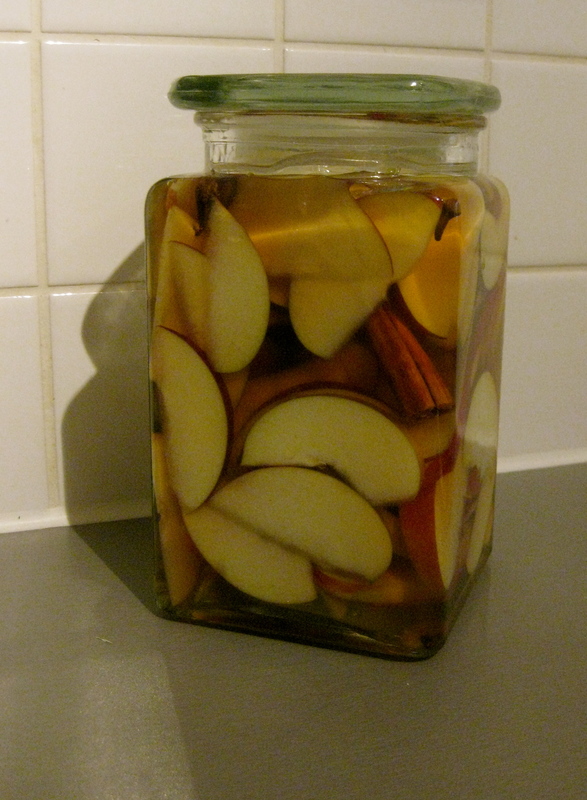 I picked up some fruit, brandy and vodka from Tescos – the thinking being that brandy on its own might be too much, whereas vodka alone has no flavour – dutifully sliced and cored some “succulent, sweet and fragrant” Empire apples, and pushed them into one of the square jars before pouring in half and half brandy and vodka to the top. I wedged in all the cinnamon sticks in the cupboard (two whole ones and enough fragments to count as a third) and some cloves and squished the whole lot around a bit. The next morning the apples had softened a bit, so I squeezed in some more sliced apples. The plan now is to leave it for 5-6 weeks before taking it home and using my mother’s apple press to squish out the apple juice. Then Google seems unanimous in its agreement on the instruction to add something to sweeten it, but I’ll cross that bridge when I get to it. Left to its own devices after that for however many months, and fingers crossed it’ll emerge as something warming, spicy and delicious. Or just pleasantly drinkable. Results to follow. – Why not get the train? I wouldn’t know where to get off I said. I know in York, but which station? I said. But which station in York? The idea of there being just one train station in a city hadn’t even crossed my mind. I should explain that as we lived in a large, capital city, we rarely visited them as a family while I was growing up – part of the reason for my naivety. My parents were the proud owners of a VW camper and we ventured around the British Isles and west coasts of France and Spain for our summer holidays, or escaped to self-catering cottages to relax around Europe. We stringently and steadfastly avoided hustle and bustle of big cities, bar one trip to Paris, preferring to spend our time as a family (with my poor father every year re-teaching us of the rules of Whist). By the age of 19, the only cities I’d properly visited were London, Paris, San Jose in Costa Rica and Grenada in Nicaragua. Not entirely surprised by the lack of an underground railway or multiple train stations in Central America, my experience of cities had always included more than one railway station, and generally an underground. Paris had an underground; I knew Warsaw had one, and Vienna, so why wouldn’t York have multiple stations or an underground system? Unbelievable I know, but please try to think of my naivety with compassion and charity, and possibly amusement, but not disdain. Step one of leaving the (outskirts of the) Big City complete, and though bemused by the general lack of public transport – buses stopped at 5pm and you couldn’t catch a train to the surrounding villages – and opening hours – closed on a Sunday? Closed at 5pm?? Why?! – I survived. I’m not claiming here that university was an immersion into country life, because I know it wasn’t. But it was where I started shooting. Time for another bit of history… my wonderful mother had always had an idea that she might enjoy shooting – a notion brought on by reliably good performances on the shooting ranges at Thorpe Park and other theme parks, sending tin cans scattering, making buzzers ring and lights flash. When she discovered that the local gun club was hidden away down our road she wanted to try, and my brother and I went with her. For a few months, I shot air rifle pellets 10m down a covered alley into paper targets, and I loved it, though sadly not enough to put up with the slightly creepy (though I’m sure well-meaning) portly instructor with no notion of personal space. When Mum stopped going because of work, I stopped too. Years later, having recounted this story repeatedly to my poor boyfriend, who listened to my anecdotes told with the repetitiveness of Friends on Channel 4, he took me on a Day Experience clay pigeon shooting. I think it was a ‘reward’ for my A Level results, but in all honesty I can’t entirely remember. He could just have been being sweet and generous. I loved it, and though I’m sure we were set up with easy targets and our instructor effectively shooting on our behalf while we supported the weight of the guns, I came away with the idea that I was pretty good at it. At university I was confronted with the vast and terrifying pick’n’mix of societies, clubs and committees thrown at every Fresher, and the array included the University of York Clay Pigeon Shooting Society (UYCPSC for not-so-short). Instead of driving his toy cars around the living room, narrowly escaping fatal collisions with my parents’ ankles, my little brother used to arrange his toy cars into traffic jams, moving them around the car-mat inch by inch. Which tells you something about our area while I was growing up, and explains why I used public transport a lot.